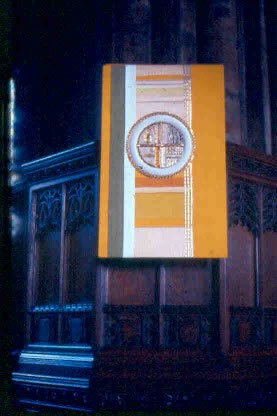 Since 1970 Malcolm Lochhead has executed a number of personal commissioned works for a large number of churches in Scotland. These works are usually commissioned as memorial or commemorative works. Yellow pulpit fall for the Nave of Glasgow Cathedral. A simple colour statement to read from a great distance as a warm punctuation. The central circle shows a Greek cross and in its quadrants, references to Saint Mungo and his attributes, the tree, the bird, the bell and the fish. Simple abstract shapes refer to the rebirth of the city.